"Model European Union Strasbourg 2017"
CCMS is happy to announce the call for applications for an amazing event "Model European Union Strasbourg 2017"!!! that takes place each year in the European Parliament in Strasbourg, a city that embodies the spirit of the European Union. For one week, 180 carefully selected participants take on the roles of Members of the European Parliament, Ministers of the Council, Interpreters, Journalists and Lobbyists, and work to amend real proposals made by the European Commission. During the conference participants will not only have the opportunity to improve their debating and decision-making skills, but they will also gain experience in the political world and network with other like-minded Europeans. The project is thus completely original in the world of simulations and is extremely popular among young Europeans from diverse study and geographical backgrounds. 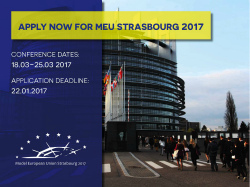 MEU Strasbourg 2017 will take place on the 18th - 25th of March in the European Parliament building in Strasbourg. This year we will be focusing our discussions on Countering terrorism and Third country nationals’ access to the internal market. Each topic will be discussed with reference to two topical commission proposals. The application period is now open, and we would like to encourage everyone interested to apply. Come to Strasbourg and be part of a unique forming experience!